It was one of Texworld and Première Vision’s highlights : Ecopel, leader in faux fur, introduced its first range of faux fur made from recycled plastics. A campaign was even launched to celebrate this event : from posters to digital ads it was hard to miss the news. This campaign was also supported by a publication in the french Journal du Textile. This fabric represents a significative step and is part of our interest in circular economy that we are going to push in the coming years. Indeed, recycling is part of the solutions available today to minimize our impact on the nature. According to the Ellen Mac Arthur Foundation, if nothing is done before 2050, there will be more plastics than fishes in our oceans. This mass of plastic is essentially made of disposable plastics and single-use items such as bottles, bags or packaging. This mass also represents a new resource when it is collected. Right from the lab : this woolly and warm fur is made from recycled plastics. Using plastic collected from the oceans and transform it into a luxurious fabric is exciting. Along with other virtuous ideas (read our SmartFur section), it will contribute to transform the way faux fur and textiles are created. 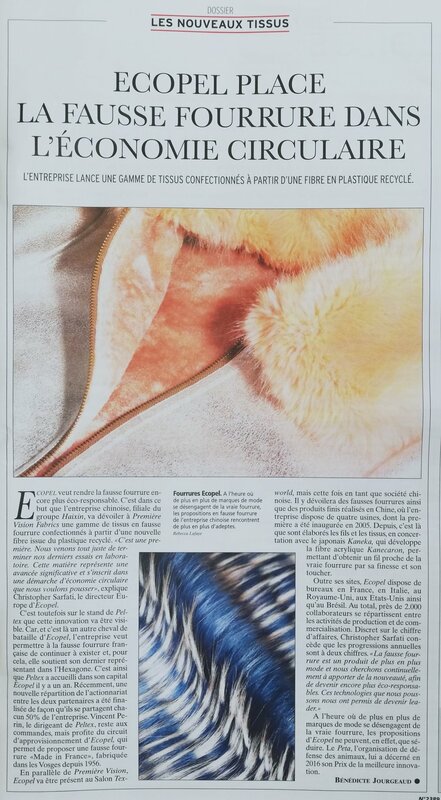 Read below the article in Journal Du textile and see more images of this campaign and Ecopel’s booth at Première Vision (don’t forget to swipe right).